Evangelism: We believe there is nothing more important than encouraging people to respond to the gospel of Jesus Christ. We desire to disseminate the gospel of Jesus Christ to as many people as possible. We believe the ultimate purpose in living is to know and glorify God and to attain eternal life through Jesus Christ our Lord, beginning within our own school families and then reaching beyond to the rest of the world that does not know of His love and sacrifice. God’s Ministry: This ministry was God’s idea, and we do not own it. We are simply the stewards of the opportunities and the resources He sends our way. Assisting Families: NRCA started by having a mission that said, “Assisting families”. Our primary focus each and every day is simply meeting the needs of our families and friends. It is our calling. Sense of Community: People will make a decision about who Jesus is by the way we treat them and the way we treat each other. Therefore, our responses will be personal, gracious, timely, and generous. Integrity: Because we live before an all-seeing God and are subject to public scrutiny, we attempt to be above reproach in the operation of this ministry by holding ourselves to the highest standards of accountability. We want to be worthy of the trust that has been placed in us by our school families. Excellence: We sweat the details to provide the highest level of quality we can achieve for the glory of God and the benefit of our constituents. Family: We believe that the institution of marriage was intended by God to be a permanent, lifelong relationship between a man and a woman, regardless of the trials, sickness, financial reverses, or emotional stresses that may ensue. We believe that children are a heritage from God and a blessing from His hand. We are therefore accountable to Him for raising, shaping, and preparing them for a life of service to His Kingdom and to humanity. We believe that human life is of inestimable worth and significance in all its dimensions, including the unborn, the aged, the widowed, the mentally handicapped, the unattractive, the physically challenged, and every other condition in which humanness is expressed from conception to the grave. 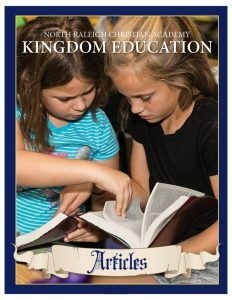 Kingdom Education: Kingdom Education is a life-long, Bible-based, Christ-centered process of leading a child to Christ, building a child up in Christ, and equipping a child to serve Christ. We believe that God has ordained three basis institutions—the church, the family, and the government—for the benefit of all humankind. The family exists to propagate the race and to provide a safe and secure haven in which to nurture, teach, and love the younger generation. The church exists to minister to individuals and families by sharing the love of God and the message of repentance and salvation through the blood of Jesus Christ. The government exists to maintain cultural equilibrium and to provide a framework for social order. The Christian school serves as a bridge in uniting these institutions within the community in the fulfillment of Kingdom Education (Deut. 6:7-9). Kingdom Education is a campaign for righteousness. This campaign into which we are called is as straightforward as the Gospel itself. Our goals are: to bring people to Christ; to deepen the walk of those who have been nominal believers; to clearly introduce the doctrines of His Lordship, sin, repentance, forgiveness, and justification by faith to those who don’t know God or those who only know Him as a ‘Friend’ and Creator; to point everyone to the resurrection and to judgment in the next world; to encourage young people and their parents to live by His standard of holiness and obedience to the Lord; to encourage intensive scriptural study and application of His Word to all areas of life; to motivate the people of God to practical actions in their communities and our nation in defense of righteousness; and to inspire those who are working at NRCA to love one another in a way that is pleasing to Him and displays to all the love of Christ. Let Kingdom Education burn within the hearts of every member of NRCA, and let it take root in each office, class, program, and activity of this ministry. 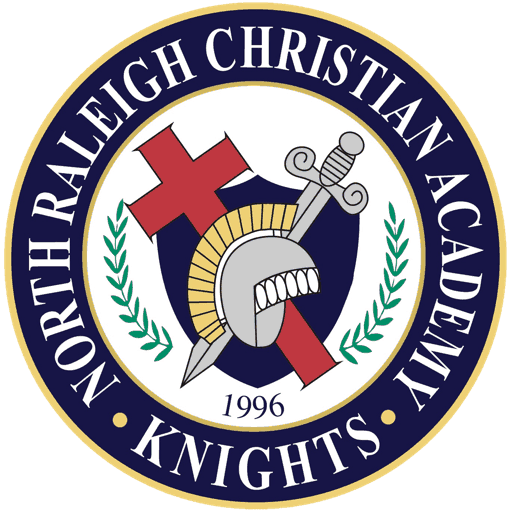 North Raleigh Christian Academy is a community Christian school assisting families by providing excellence in academics, fine arts, and athletics, while instilling Biblical principles in students’ lives that they might impact their society for Christ.